Eyewitness reportage from the front line of the Falklands War, by the first officially commissioned female war artist to be embedded with troops. Linda Kitson's line drawings have recorded seminal moments in British history. This exhibition explores her work of the last 40 years including drawings of the 1982 Falklands War as the first officially commissioned female war artist to accompany troops into combat. 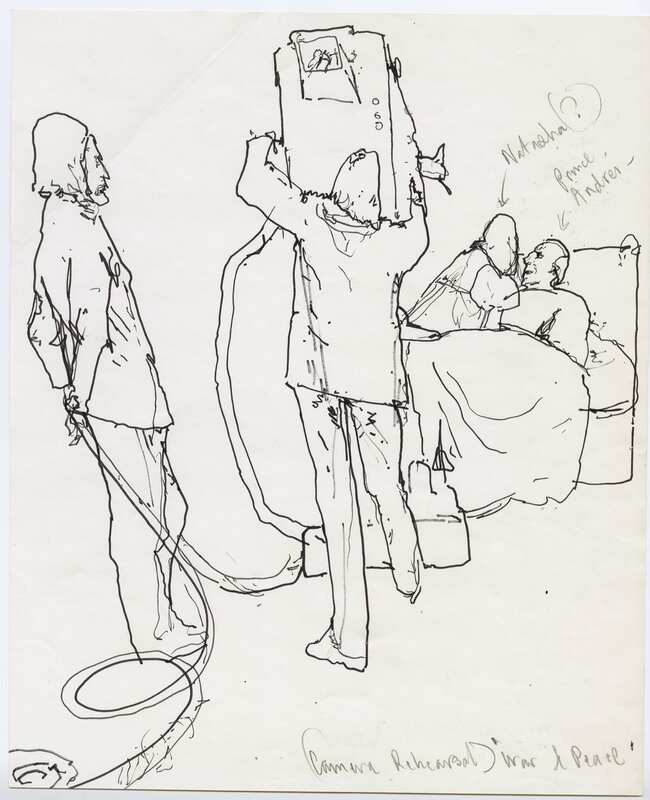 It will also include her drawings behind the scenes at the BBC's 50th anniversary in 1972 and on Fleet Street for The Times before the Wapping Dispute and 1980s move to digital printing. Alongside Kitson's drawings for The Folio Society and Spectator, the exhibition will show her most recent iPad drawings which explore the drama of city architecture. Curated by Quentin Blake, who has known Kitson since she was first a student at the Royal College of Art. 2 Granary Square, London N1C 4BH. Open Tuesday-Sunday 10am-6pm. Closed Mondays. Admission (one ticket gives admission to all three galleries) £8.25 inc gift aid. This excellent exhibition at the House of Illustration featuring the drawings of the artist Linda Kitson leaves you wanting more. Separated into sections including the BBC, The Folio Society, Newspapers, The Falklands, and more recent drawings, the exhibition starts with a selection of very good fluid on the spot sketches of behind the scenes at the BBC and illustration commissions for the Folio society. 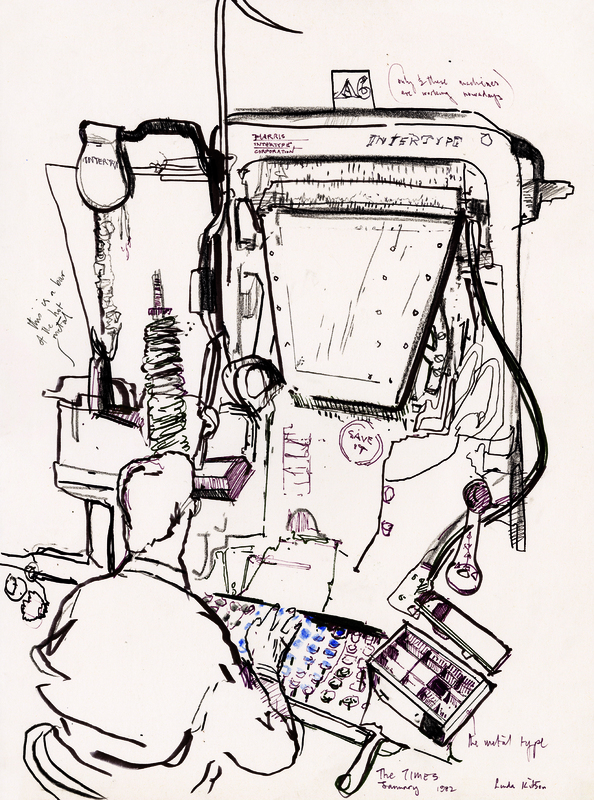 In the series of drawings for 'The Times, The Machine Room', Kitson beautifully documents men and machines at work with fluid spontaneous pencil and ink on paper. 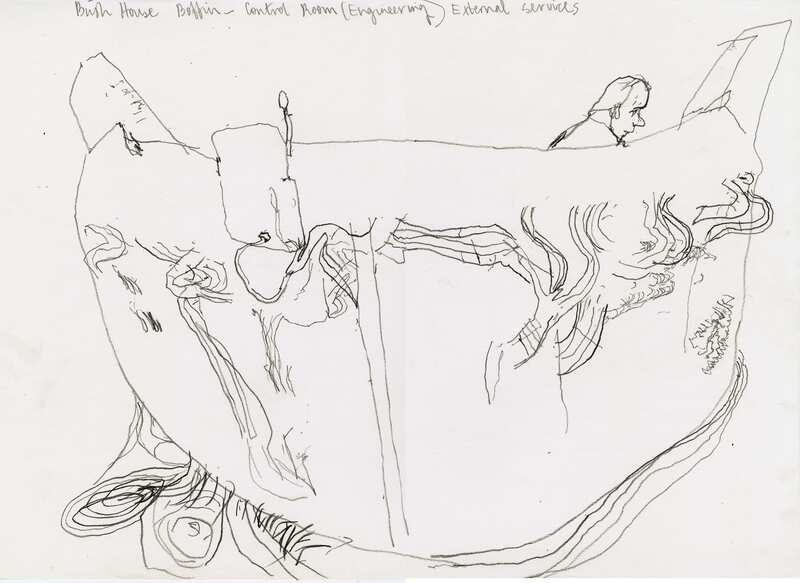 This leads on to a much more poignant series of drawings of the 1982 Falklands conflict, a commission from the Imperial War Museum documenting men and machines engaged in a very different kind of symbiotic relationship, War. In 1982 Kitson documented the Falklands War conflict as the first female artist to have been commissioned to accompany troops into battle. 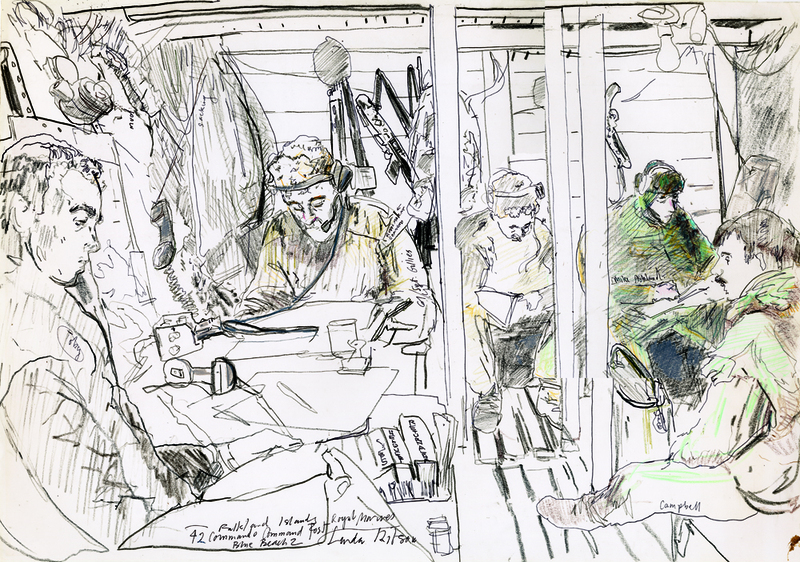 Kitson sailed to the Falklands with 3000 troops and for three months made over 400 drawings in sub-zero temperatures documenting the conflict. 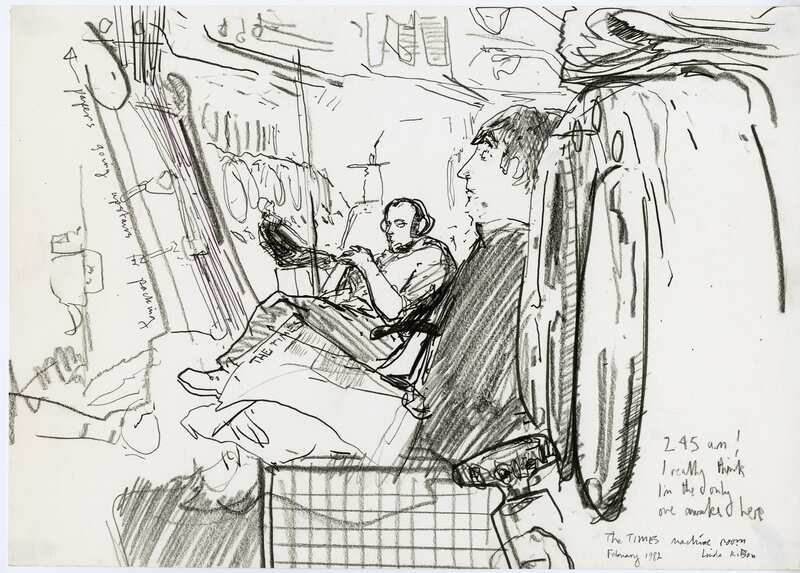 Some of the drawings show the paraphernalia and logistics of war, others the relentlessness and boredom, depicting the claustrophobia of life below decks on route to a distant conflict. 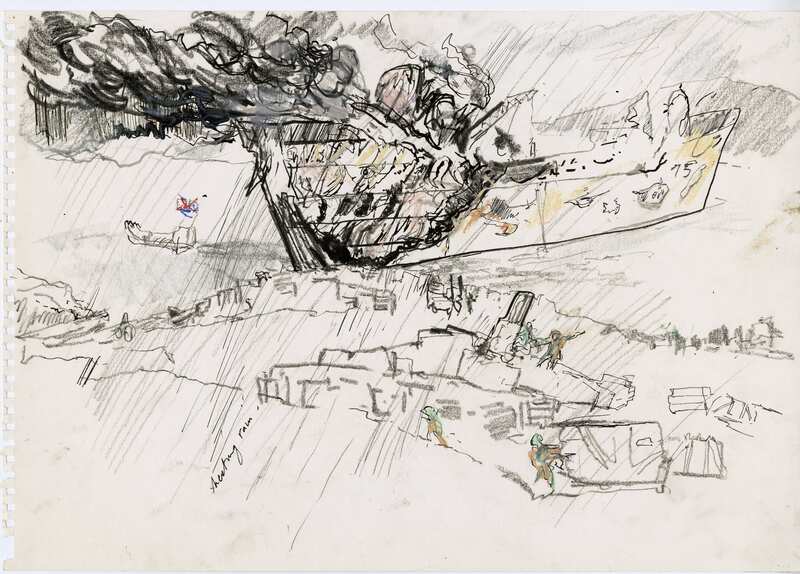 One drawing in the Falklands series particularly stands out titled 'Sir Galahad in flames at Fitzroy waters' a visceral conté pencil, oil pastel and ink on paper drawing showing the ship still ablaze 10 days after having been hit by three bombs. I'm almost convinced I can see the ghost of a massive portrait in the mark making of twisted metal exposing the guts of the ship. The harsh diagonal stabbing marks of the pencil almost as if it had been held in a clenched fist. This drawing for me is the most powerful record of the conflict, almost as if all sense of artistry and artifice has been abandoned in order to capture the horror, immediacy and senselessness of war. 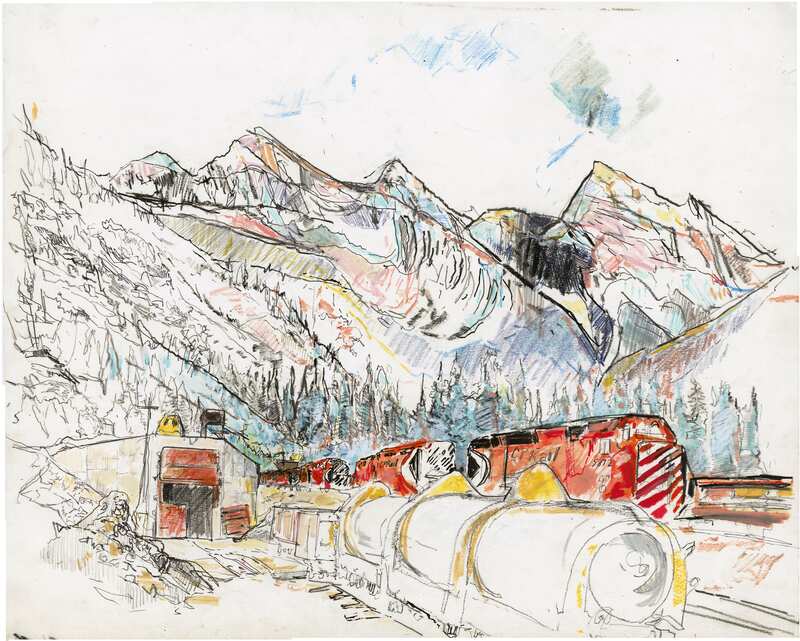 The drawings have a sense they have been wrested from a harsh environment. Kitson in fact endured freezing temperatures and harsh conditions to make this record, often hardly able to operate. The Falklands drawings are presented beautifully floating in frames; the pages having been torn from the spiral binding of the original sketchbooks giving a sense of the violence they don't always portray. Interestingly the work next to this is at first glance more shocking in its portrayal of dead and dying souls, but this time it's a record of behind the scenes on the 1984 set of 'the killing fields'. The dead and dying are in effect bit part actors who had actually experienced the reality of what they were portraying. Kitson in a recent radio interview http://www.bbc.co.uk/programmes/b08j99bf reflected on her time in the Falklands and was obviously very deeply affected by what she saw and chose not to depict. The killing fields body of work seems almost cathartic and in stark contrast to the Falklands drawings in their lack of obvious graphic war imagery often portrayed by other war artists. 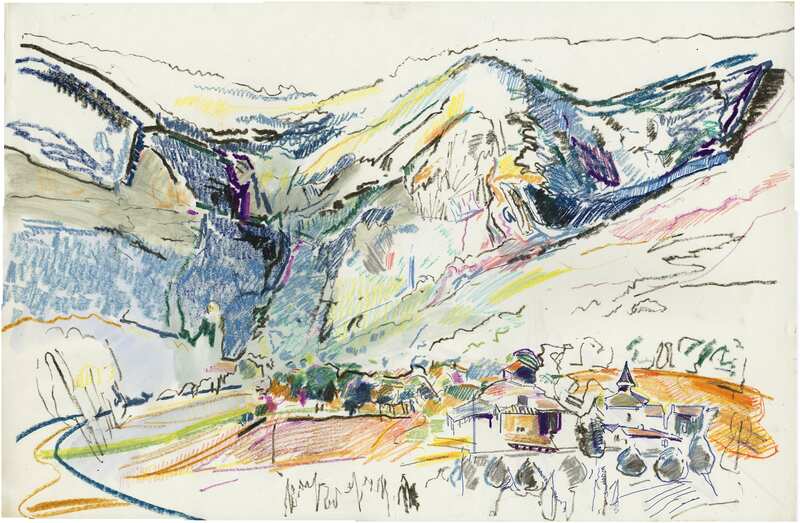 The exhibition closes with a series of energetic complex landscape drawings of regions of France and Northern Italy. 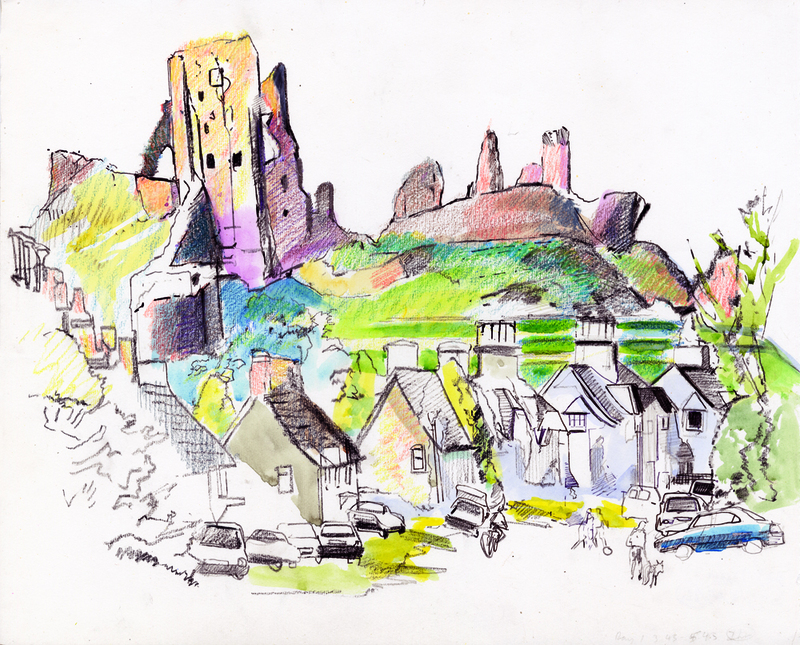 These resulted in further reportage commissions such as the Canadian Pacific Railway and drawings of English and Scottish Castles in 2000. The last section shows Kitson's new work featuring a large IPad drawing of the urban environment. 'The Gherkin' 2016 juxtaposes the old and new of urban renewal with an intense Fauvist sensibility. These images are much more about paint and colour and as a single final image of Kitson's body of work acts as a perfect exclamation point to the whole exhibition, expressing surprise and excitement for what lies ahead. Linda Kitson (b. 17 Feb 1945) is a British artist who studied at Central Saint Martins and the Royal College of Art, where she specialised in illustration. She has since taught at Camberwell College of Arts, Chelsea College of Art and Design, City and Guilds Art School and the Royal College of Art. Kitson was commissioned by the Artistic Records Committee of the Imperial War Museum as the official war artist for the Falklands Task Force. She is the first female artist to have been officially commissioned to accompany troops in battle. 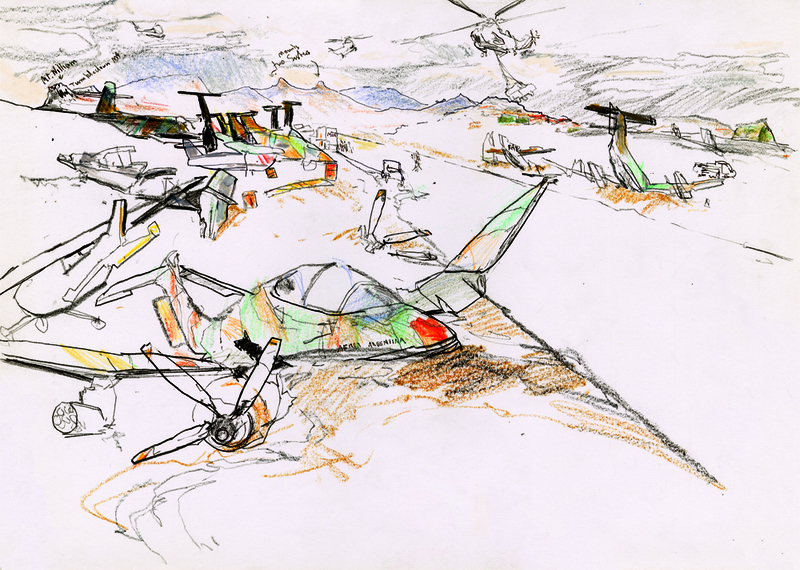 Many of her drawings are now part of the Imperial War Museum's collection. House of Illustration is the UK's only public gallery and education space dedicated solely to illustration, with a creative programme of exhibitions, talks and events. Founded by Sir Quentin Blake it opened in July 2014 at the heart of the King's Cross regeneration area. It is the place to see, learn about and enjoy illustration in all its forms; from picture books to political cartoons, advertisements to animation and scientific drawings to fashion design. A registered charity, House of Illustration identifies and promotes new talent, commissions new work and has an illustrator-led learning programme for all ages. houseofillustration.org.uk.